The final European Grand Prix of the season staged with all the passion of the tifosi and Wildside get you to the centre of the action. Monza has a special atmosphere; staged in a centuries old park on the outskirts of Milan there is a real carnival feeling about the GP. Wildside get you in and out of the event with top grandstand seats and minimal hassle. Recall the golden age of continental driving and make the most of your Italian GP tour – join the extended drive down tour taking in the Italian, Swiss and French Alps with overnight stays in beautiful chateaux. Monza’s pedigree can be traced back to the 1920’s and it has held a place on the Championship calendar since the very beginning of the series in the 50’s. Of course think of Monza and you think of Ferrari. 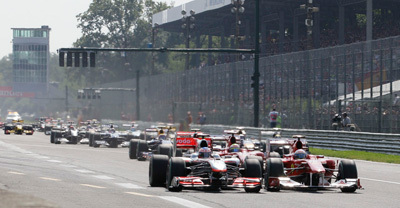 As you pass through the gates to Monza Park you will think that there is only one team racing – Ferrari. The tifosi are out in force in the tens of thousands and the grandstands are awash in a sea of red. No hamburgers or hot dogs here, instead it’s pasta, pizza and paninis – everything dispensed with ‘justa a toucha of Italian brio’. Normally, the sun is shining in September so the weather is very warm. Ideal GP watching conditions. We will be based in Milan so you will have the chance for sight-seeing and shopping in the very heart of Italy’s fashion capital. Transfer to the circuit will be air conditioned vehicles so just sit back and relax – it’s all taken care of. It’s just 30 minutes to the circuit and a short stroll through the Monza Park will take you to the prime spectator location on the track. This is the very first chicane after the start/finish straight and always has plenty of action. Just before braking for the chicane the cars are at their fastest point on the track and in the chicane they are at the slowest. 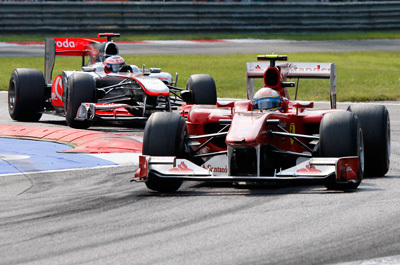 This is the perfect overtaking opportunity and the chicane has seen plenty of drama over the years.